Photo Credit: Spc. Danielle Ferrer. Today I give you a modern day trailblazer: Jennifer Walker. One of the greatest privileges we enjoy living in Sierra Vista is the opportunity to meet and get to know so many of our country's finest men and women - those who are in harm's way (either in the military or the border patrol) and those who keep the home fires burning while they are away. As with any subset of our population, there are a few in the ranks who spend more than their share of time whining and fretting. But most of these families are brave, determined, disciplined, and thrilled to be serving their country. I am most impressed with those who manage to carry on while their spouses are away, while their families and support systems are in other states, while their children are dealing with fears uncommon to most kids, and while they face the myriad daily unknowns that accompany a life in the military. They are truly my heroes. And, as I've said before on this blog, I'm double impressed when these same families manage to not only keep their own heads above water, but they plug into a local church, get involved in their community, and even serve others eagerly. We have had the honor of befriending and serving with a number of single guys and gals as well as military families who have plain out made me proud. Sure, they have tough days, and our church is very sensitive to their unique needs and tries to help out in any way we can. But these folks are not whining and complaining. They're serving with joy and their testimony is powerful. I give you the story of one such incredible woman, copied from www.army.mil. 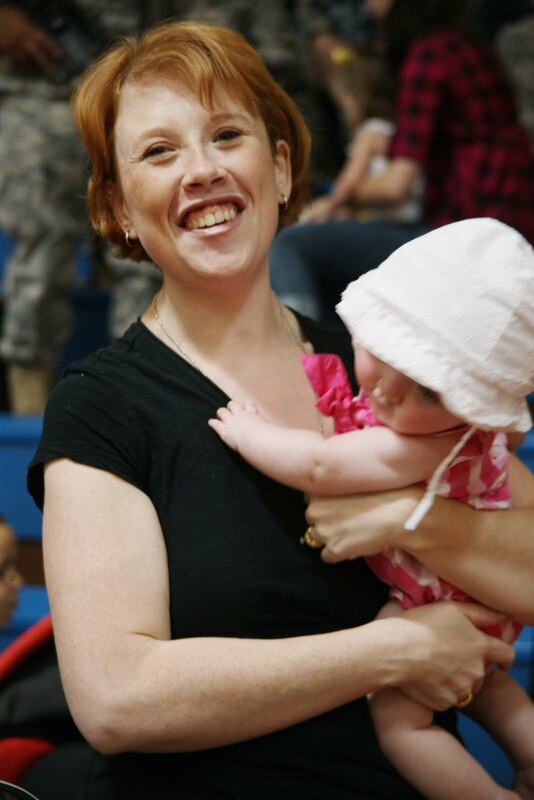 FORT HUACHUCA, Ariz., -- The thought of her deployed husband is something Jennifer Walker can't let keep her down. After all, there are play dates for two sets of twins, soccer games, school and homework to do, not to mention housework. She can't forget the doctors' appointments, the birthdays and the holidays. So instead of worrying, she holds her head high, puts on a face that gives her children confidence and soldiers on as a proud Army wife. "From the moment I met him at 16, I knew that he was the one for me," said Walker, whose husband, Capt. Joshua Walker, deployed on Sunday. Walker is the Company A commander for the 40th Expeditionary Signal Battalion. The Walkers have been together for 11 years, and this is Walker's second deployment. There are many challenges for a military spouse when faced with a deployment. Walker said one of the most difficult challenges she faced during the first deployment was not being able to hear her husband's voice whenever she wanted. She also only had one set of twins to care for. Walker's two older sons Robert and Kenneth were 8 during the first deployment and they were relatively self-sufficient, she said. The boys are now 10 and Walker said they have become more independent and helpful as each days passes. Now this family of four has become a family of six with the addition of another set of twins. Walker's youngest daughters, Sarah and Kathryn, are just 7 months old. "For this deployment I think my biggest challenge is not getting overwhelmed when caring for my younger children without my wingman here to help," said Walker. The youngest of the twin girls, Sarah, requires special care. Care that Walker said requires the family to drive back and forth to Phoenix. Sarah was born with craniosynostosis, a genetic condition which causes an infant's soft spot to close prematurely. Sarah underwent surgery on May 20 and her second procedure will take place in September or October depending on her growth, said Walker. "The first year an infant's head is very soft and malleable, and the doctors have to watch her and wait for the optimal time to perform the procedure," said Walker. "We are hopeful that my husband will be able to come back for the second surgery but are not sure at this time what will be possible. However, his command and the Family Readiness Group have been very supportive." As for the older boys, Walker said they are looking forward to summer vacation. The Walkers enjoy traveling, though without Capt. Walker, accomplishing that will be much more difficult, she explained. Walker said she signed the twin boys up for several SKIESUnlimited classes through the post for this summer, and the boys will be playing soccer in the fall. "[Because of] the deployment we were able to sign the boys up for these activities at no cost to us which is very nice," said Walker. Still, even with all the activities to keep them busy, Walker said the boys miss their father a lot. "They have started acting out some, and other times [they] just get quiet," said Walker. "I try to pay attention to them and their moods and give them space when I can." One of the ways Walker helps ease the pain of missing their father is for the family to make care packages. Walker said during the last deployment, the family was constantly making care packages to send to their father. The boys were free to include papers they wanted to share with their father whenever they wanted. Once the box was filled, Walker said they would immediately ship it and start another. "During this deployment, their spelling and writing skills have improved a lot, and we are planning on setting up e-mail accounts for each of them where they can send messages to their dad and he can message them back when they want," said Walker. Along with creating care packages for her husband, Walker, a stay-at-home mother and self-proclaimed 'domestic diva,' also divides her time with many other activities outside of the home. Walker volunteers her time with many groups and organizations. She is the Family Readiness Group leader for her husband's company, and for the last two years she has been the assistant treasurer/disbursements chair for the Fort Huachuca Community Spouses Club. Walker is involved with the work that they do for the military community, as well as the community of Sierra Vista. Although that's enough to keep any mother of four busy, Walker also makes time to volunteer at her older twins' school, Gen. Myer Elementary School. There is also the ladies' bible study group which she attends weekly at the Sierra Vista First Baptist Church. Walker is also a member of Moms of Preschoolers. "This group is a Christian-based mom's group where the moms get together twice a month for fellowship, food and friendship, while the kids play together," said Walker. Somewhere throughout her busy schedule, Walker also finds time to bowl with one of the ladies' bowling leagues on post. She's also an avid reader and, when she finds the time, she enjoys sewing and crocheting. Walker said she just tries to stay busy and not stress. "Personally I don't think that I am doing anything that anyone else would not do," said Walker. "This is the life of a military spouse. We deal with whatever we have to and keep on going. I love the movie Finding Nemo and one of my favorite quotes is from one of the fish. She talks about 'Just keep swimming;' that is all I do." Article by: Spc. Danielle Ferrer. I would love it if you would leave a comment offering to pray for Jennifer and her family. They need it and appreciate it!